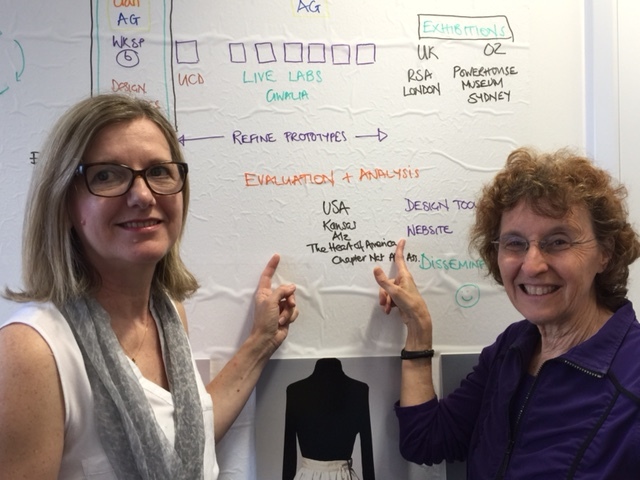 I love being around visionaries and Cathy Treadaway, PhD, is certainly one of them, changing the world one playful textile at a time. Cathy is the Professor of Creative Practice at the Cardiff School of Art and Design, Cardiff Metropolitan University, Wales, United Kingdom and she contributed to my upcoming book, Connecting in the land of Dementia: Creative Activities to Explore Together. 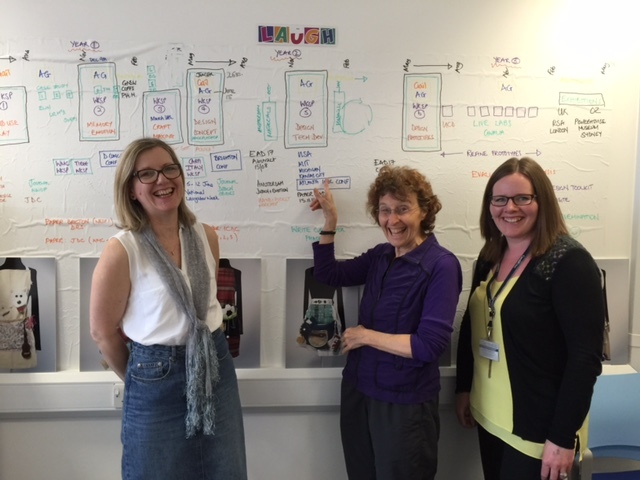 I recently visited her at her university office in Cardiff, Wales, and wanted to share a few of her successes with you. In these stories, you’ll find intriguing ideas you can adapt to your own situation. They often visited the park, walking the paths hand-in-hand, admiring the flowers and foliage, listening to the birdsong, enjoying the breeze and the fresh air. But as his dementia progressed, he could no longer navigate the park. Until Cathy Treadaway and her team created a tactile textile replica of the park, complete with interactive technology. When he pressed one of the tree icons, he heard the sound of the wind. He pressed another and was rewarded with birdsong. Now, they sit together and he traces the cloth paths and creates the sound effects as she talks about the outdoors and reminisces about their times together. For Cathy Treadaway, that’s what her work is all about: enhancing life and keeping people connected. She specializes in creating individualized “playful objects,” interactive textiles that mirror the person’s interests and passions. When Cathy asked about one person’s special interests, a favorite pet, a Westie, came up again and again. Cathy and her team set to work, building an apron that featured a soft white Westie that barked when pressed. The team velcroed the dog onto an apron. 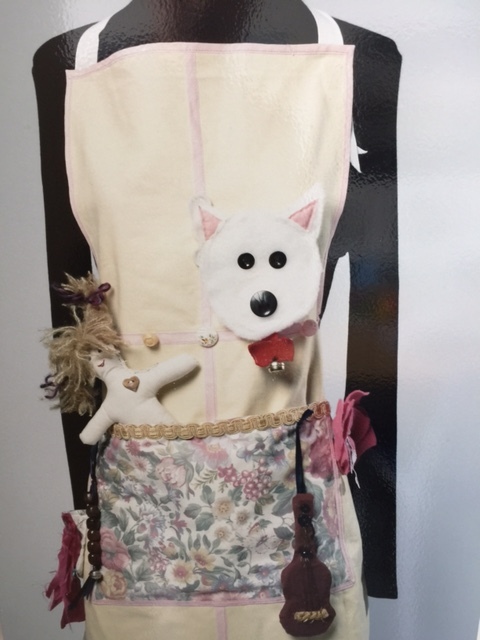 The woman living with dementia was fascinated by the apron and by the texture and sounds of the dog. So was her two-year-old great granddaughter. 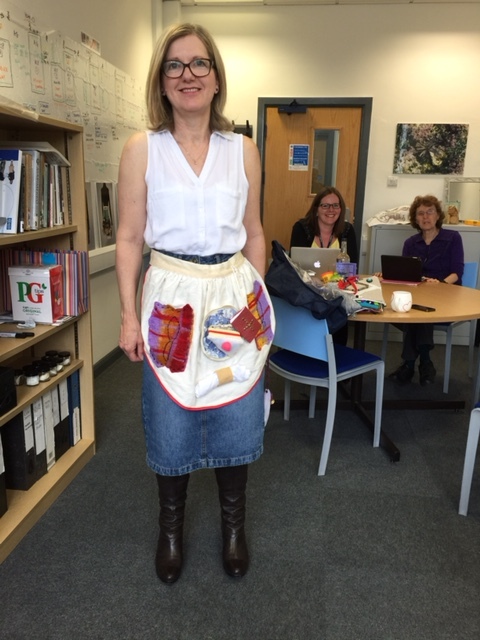 The apron gave her focus and pleasure and also offered conversation points for her multigenerational family. WOW. Impressive resource. and as always, great writing. Thanks so much. I was so inspired by this. Thanks! We met Cathy in Wales and she’s an astonishing and creative person.